U. S. Navy Douglas A-4 Skyhawk Pratt & Whitney JT8D / Pratt & Whitney J52 fifth stage Compressor Blade. P/N 587305. It is a nonairworthy blade, and is sold for display only. It is approximately 3 3/4" long, a very interesting item and it shows very well and it would make an excellent show item for the home or office. The Pratt & Whitney JT8D was extensively used by civilian aircraft around the world such as the Boeing 727, Boeing 737, the DC-9 and MD-80 and it is still used today under the J52 turbojet designation primarily by the military on aircraft such as the Douglas A-4 Skyhawk, A-6 Intruder, etc. Sold as is, no returns. U. S. Navy Douglas A-4 Skyhawk Pratt & Whitney JT8D / Pratt & Whitney J52 fifth stage Compressor Blade. P/N 587305. 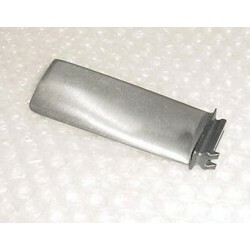 It is a nonairworthy blade, and is sold for display only. It is approximately 3 3/4" long, a very interesting item and it shows very well and it would ..
3 1/4" U.S.A.F. 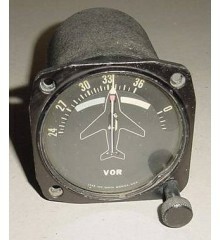 Douglas A-4 Skyhawk Warbird Low Altitude Bombing System Indicator. Very clean item. It shows very well and it would make an excellent show item for the office or home or on a Warbird Douglas A-4 Skyhawk mock panel.